The toonie, formally the Canadian two-dollar coin, was introduced on February 19, 1996 by Public Works minister Diane Marleau. As of 2019[update], it possesses the highest monetary value of any currently circulating Canadian coin. 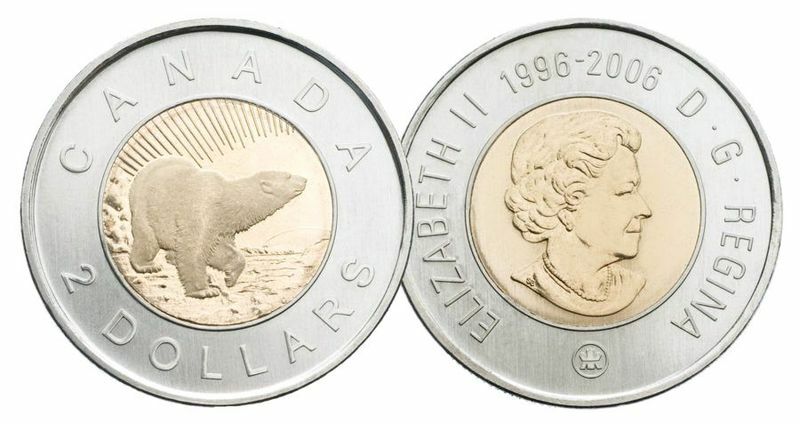 The toonie is a bi-metallic coin which on the reverse side bears an image of a polar bear by artist Brent Townsend. The obverse, like all other current Canadian circulation coins, has a portrait of Queen Elizabeth II. It has the words "ELIZABETH II / D.G. 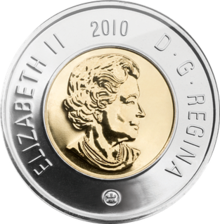 REGINA" in a different typeface from any other Canadian coin; it is also the only coin to consistently bear its issue date on the obverse. The coin is manufactured using a patented distinctive bimetallic coin-locking mechanism. The coins are estimated to last 20 years. The discontinued two-dollar bill was less expensive to manufacture, but lasted only one year on average. On April 10, 2012, the Royal Canadian Mint (RCM) announced design changes to the loonie and toonie, which include new security features. Prior to 2012, the coin consisted of an aluminum bronze inner core with a pure nickel outer ring; but in spring 2012, the composition of the inner core switched to aluminum bronze coated with multiply-plated brass, and the outer ring switched to steel coated with multiply-plated nickel. The weight dropped from 7.30 to 6.92 g, and the thickness changed from 1.8 to 1.75 mm. The Mint states that multiply-plated steel technology, already used in Canada's smaller coinage, produces an electromagnetic signature that is harder to counterfeit than that for regular alloy coins; also, using steel provides cost savings and avoids fluctuations in price or supply of nickel. "Toonie" is a portmanteau word combining the number "two" with the name of the loonie, Canada's one-dollar coin. It is occasionally spelled "twonie" or "twoonie", but Canadian newspapers and the Royal Canadian Mint use the "toonie" spelling. When the coin was introduced, a number of nicknames were suggested. Some of the early ones included the "bearie" (analogous to the loonie and its loon), the "bearly", the "deuce", the "doubloonie" (a play on "double loonie" and the former Spanish doubloon coin), and the "moonie" (because it depicted "the Queen with a bear behind"). Jack Iyerak Anawak, member of Parliament from Nunatsiaq (the electoral district representing what is now the territory of Nunavut), suggested the name "Nanuq" [nanook, polar bear] in honour of Canada's Inuit people and their northern culture; however, this culturally meaningful proposal went largely unnoticed beside the popular "toonie". The name "toonie" became so widely accepted that in 2006, the RCM secured the rights to it. A competition to name the bear resulted in the name "Churchill", a reference both to Winston Churchill and to the common polar bear sightings in Churchill, Manitoba. Paul Martin announced the replacement of the $2 banknote with a coin in the 1995 Canadian federal budget speech. The RCM spent C$17,400 to canvass 2000 Canadian households about which of the 10 theme options they preferred. Under the direction of Dr. Hieu C. Truong, the RCM engineering division designed the two-dollar coin to be made from two different metals. The metals for the bimetallic coin would be lighter and thinner than those produced anywhere in the world. To join the two parts, the engineering division selected a bimechanical locking mechanism. By the end of 1996, the Winnipeg facility had struck 375 million of these coins. The coin was officially launched at Ben's Deli in Montreal on February 19, 1996. The weight of the coin was originally specified as 112.64 grains, equivalent to 7.299 g.
The community of Campbellford, Ontario, home to the coin's designer, constructed an 8-metre-tall (26 ft) toonie monument, similar to the "Big Loonie" in Echo Bay and the Big Nickel in Sudbury. 1999 The founding of Nunavut G. Arnaktavyok 25,130,000 Commemorating the founding of Nunavut, featuring an Inuit drummer. 2000 Knowledge/Le Savoir Tony Bianco 29,880,000 Millennium edition, the coin value "2 DOLLARS" appears on the obverse instead of on the reverse. It also features three polar bears. The issue date of the 2000 coin is on the reverse instead of the obverse side. 2002 The 50th anniversary of Queen Elizabeth's reign Brent Townsend 27,020,000 The issue date reads "1952–2002". 2006 10th anniversary of $2 coin Tony Bianco 35,319,000 Featuring an updated pose of the bear looking up at the dramatic lines of an aurora borealis. The first circulation coin to be introduced with the new mintmark. The issue date reads 1996–2006. 2008 400th anniversary of founding of Quebec City and first French settlement in North America. The coin was designed by jeweller Genevieve Bertrand, a Quebec City native. The engraving was done by RCM engraver William Woodruff. 6,000,000 The design of the coin is dominated by a large fleur-de-lis. Other elements include a ship, and lines representing the St. Lawrence River. 2011 Boreal forest Nolin BBDO Montreal 5,000,000 Celebrates Canada's boreal forest that covers over half of Canada's landmass. Features three stylized trees, a bird and a man. 2012 War of 1812: HMS Shannon Bonnie Ross 5,000,000 Part of a series of commemorative issues on the War of 1812. Features a modified reverse with HMS Shannon in the centre core, as well as artwork with "The War of 1812, HMS Shannon" in the outer ring. 2014 Wait for Me Daddy Claude Dettloff 5,000,000 Inspired by the iconic photograph known as Wait for Me, Daddy, which was taken on October 1, 1940, in New Westminster, B.C. by photographer Claude Dettloff. 2015 200th anniversary of the birth of Sir John A. Macdonald Glen Green 5,000,000 The design features a portrait of Sir John A. Macdonald superimposed on the map of Canada in the centre, and in the outer ring are the dates "1815" and "2015". 2015 100th anniversary of the In Flanders Fields poem Glen Loates 5,000,000 Part of a collection featuring a coloured and uncoloured quarter duo, the reverse depicts Lieutenant Colonel John McCrae sitting in a field of poppies as he composes the poem. 2017 Canada 150 Timothy Hsia Commemorating the 150th anniversary of the Confederation of Canada. The design is titled Dance of the Spirits and shows a pair of paddlers dwarfed by a night sky alive with the ever-shifting movement of the Aurora Borealis. The aurora portion glows in the dark. The theme of the coin is "Our Wonders". 2018 100th anniversary of the Armistice of 1918 Laurie McGaw Designed by Canadian artist Laurie McGaw, the coin design features two symbols of remembrance. A soldier’s helmet represents the end of the First World War and serves as a solemn reminder of the many lives lost during history’s first mechanized war. Below the helmet lies a large poppy, the official bloom of remembrance, whose bright scarlet colour is re-created on the selectively coloured coins. 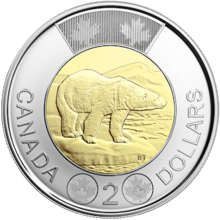 From 2010 to 2015, the Royal Canadian Mint issued a two-dollar coin that depicts a different and unique image of a young animal on the coin's reverse. These special toonies have limited mintages and are available only in the six-coin specimen sets. A failure in the bimetallic locking mechanism in the first batch of toonies caused some coins to separate if struck hard or frozen. Despite media reports of defective toonies, the RCM responded that the odds of a toonie falling apart were about one in 60 million. It is against the law to deliberately attempt to separate a toonie. Defacing coin currency is a summary offence under the Canadian Criminal Code, section 456. ^ "Balance and composition – the 2-dollar coin". Royal Canadian Mint. Retrieved 2012-04-21. ^ Fred Langan. "Canada's new coin a 'toonie'? By Fred Langan THE CHRISTIAN SCIENCE MONITOR - Tuesday, Feb. 20, 1996 | 11:59 a.m." Las Vegas Sun. Retrieved 2011-12-02. ^ Royal Canadian Mint. "The Loonie and Toonie have evolved". Royal Canadian Mint. Retrieved 22 April 2012. ^  Royal Canadian Mint. Retrieved 2012-07-12. ^ George S. Čuhaj; Thomas Michael (11 July 2011). 2012 Standard Catalog of World Coins 2001 to Date. Krause Publications. p. 144. ISBN 978-1-4402-1575-9. ^ "The New $2 Coin". Royal Canadian Mint. Retrieved 2012-04-21. ^ "Order Amending Part 2 of the Schedule to the Royal Canadian Mint Act". Canada Gazette. Government of Canada. Retrieved 2012-01-14. ^ a b "'Toonie' makes its debut - CBC Archives". Archives.cbc.ca. Retrieved 2011-12-02. ^ "Jack Iyerak Anawak on Two-Dollar Coin - Hansard April 26th, 1996, Retrieved March 30, 2011". Openparliament.ca. 1996-04-26. Retrieved 2011-12-02. ^ "WordReference Forums - Vocabulaire Anglo-Normand, Retrieved March 30, 2011". Forum.wordreference.com. 2010-08-05. Retrieved 2011-12-02. ^ Poff, Stephanie. "The Story Behind Your Pocket Change". cwf-fcf.org. Canadian Wildlife Federation. Retrieved 12 February 2019. ^ Royal Canadian Mint. "Canadians Choose Churchill as Official Name of Toonie Polar Bear." Retrieved 27 Jan 2011. ^ a b Girard, Daniel (11 March 1995). "It's a real toss-up but here's our 2-cents worth: Call the $2 coin an American dollar". Toronto Star. ^ "Canada Gazette, 42-43-44 ELIZABETH II, Chapter 26, p. 614". 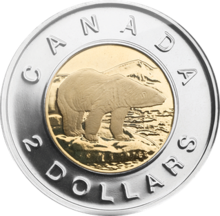 ^ "Canada's two-dollar coin and its polar bear turn 10 this year". CNW Telbec, August 28, 2006. ^ "Order Authorizing the Issue of a Two Dollar Circulation Coin Commemorating the Millenium and Specifying its Characteristics, SOR/2000-245". CanLII. 2011-11-19. Retrieved 2011-12-02. ^ "'Toonie' turns 10 ... and gets a facelift". Cbc.ca. 2006-08-28. Retrieved 2011-12-02. ^ "Talisman Coins". Archived from the original on October 8, 2011. Retrieved July 25, 2016. ^ Quebec City - 400th Anniversary Toonie. Royal Canadian Mint. Retrieved 27 January 2011. ^ Unser, Darrin Lee (June 22, 2012). "Canadian HMS Shannon $2 Coin Commemorates War of 1812". Retrieved July 25, 2016. ^ "Wait for Me, Daddy Coin Pack (2014)". Retrieved July 25, 2016. ^ "Sir John A. Macdonald Coin Pack (2015)". Retrieved July 25, 2016. ^ "2015 Remembrance Coin Pack (2016)". Royal Canadian Mint. Retrieved October 16, 2018. ^ "75th Anniversary of the Battle of the Atlantic Coin Pack (2016)". Royal Canadian Mint. Retrieved October 16, 2018. ^ "The Canada 150 Toonie Makes History (2017)". Royal Canadian Mint. Retrieved October 16, 2018. ^ "The Battle of Vimy Ridge Special Wrap Roll (2017)". Royal Canadian Mint. Retrieved October 16, 2018. ^ "100th Anniversary of the Armistice of 1918 Special Wrap Roll (2018)". Royal Canadian Mint. Retrieved October 16, 2018. ^ "Special Edition Specimen Set - Young lynx (2010)". Royal Canadian Mint. Retrieved October 16, 2018. ^ "Special Edition Specimen Set - Elk Calf (2011)". Royal Canadian Mint. Retrieved October 16, 2018. ^ "Special Edition Specimen Set - Wolf Cubs (2012)". Royal Canadian Mint. Retrieved October 16, 2018. ^ "Special Edition Specimen Set - Black Bear Cubs (2013)". Royal Canadian Mint. Retrieved October 16, 2018. ^ "Special Edition Specimen Set - Baby Rabbits (2014)". Royal Canadian Mint. Retrieved October 16, 2018. ^ "Special Edition Specimen Set - Baby Raccoons (2015)". Royal Canadian Mint. Retrieved October 16, 2018.